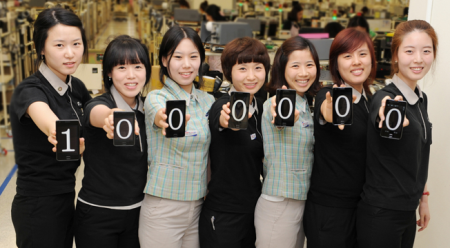 Samsung announced recently that their newly-released Galaxy S2 has surpassed 1 million units sold. I personally have not seen or used this phonemyself, but it look hot! Obviously hot enough where it has sold 1 million units since April 29th. Do a bit of math, 1 million units sold from April 29th to May 30th means that there was a Samsung Galaxy S2 sold every 3 seconds – incredible! Samsung has gone further to announce that the Galaxy S2 has been their fastest selling device ever. If you are reading this post thinking that you have missed out on this phone, you haven’t. It’s not available in North America yet (assuming most of our readers are in North America) but we’re hoping for a massive blanket effect similar to the first Galaxy S. What do you think? Does 1 million units sold in this short amount of time sound cool to you. Leave your comments below or on our Facebook wall.